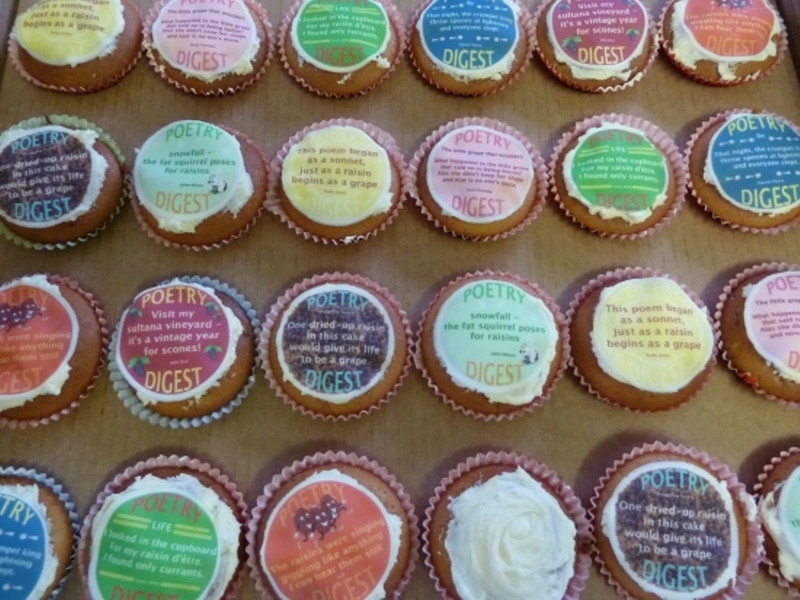 Meet Poetry Digest, the magazine that ices poems on cakes! Poetry Digest Editors, Swithun Cooper and Chrissy Williams do a special edition for the Young Poets Network. The Poetry Digest website says we met whilst living in Eastern Europe – then made our own zine when working in an all-night bakery, and were exiled to the UK. Unfortunately, it’s a lie. We made it up. The truth is that we work at the Poetry Library, at Southbank Centre, where Chrissy digitises the magazines and I [Swithun Cooper] help conserve them. There are thousands, going back almost 100 years. Glossy ones with big-name poets, and photocopied ones made by someone in a bedroom. Ones that only publish poems with 14 lines, or more than 40. Working on these, we realised there was room for everyone – and no reason we couldn’t join in. We were also thinking about the ugly twin of poetry: everything that doesn’t involve writing the poem. Am I doing it wrong? Is the poem too much like everyone else’s? Is it not enough like everyone else’s, so I sound out of date? Has it been done before, and I just haven’t realised? Chrissy and I realised we had to put those thoughts out of our minds and write what we wanted to. All you really have to do is make the poem the best type of poem that you can, one that reflects the way that thoughts and feelings and words happen inside your head. We decided, in our own way, to do something similar. Something fun, and poem-related, that wasn’t about those things – a light-hearted alternative that was still serious about poetry. Poetry Digest is published on cake. 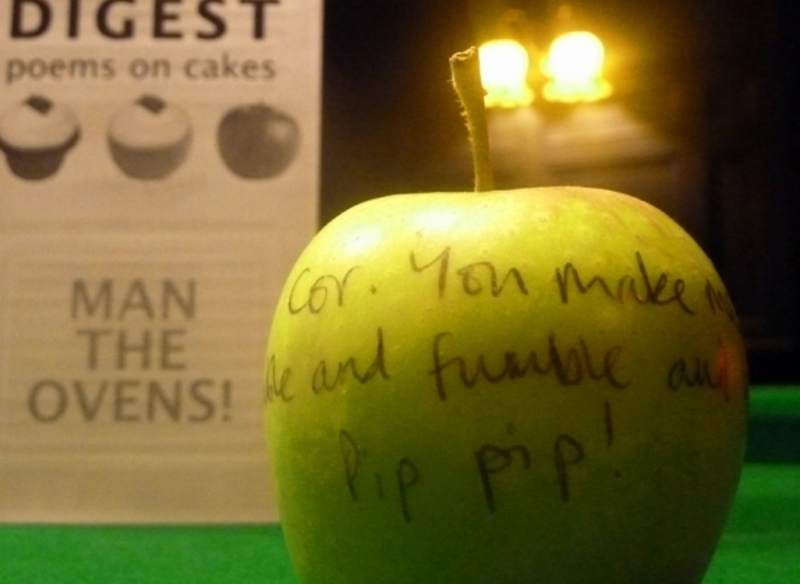 The poems relate to the cake’s ingredients and only exist until you’ve eaten them. As Isobel Dixon put it on one cake, we’re “slipping poetry into the bloodstream”. We invite submission for poems inspired by bad food puns ( “big apple”, “raisin d’etre”, “berried alive”), collect the poems that people send in, and then go through them deciding which we like the best. This is especially hard. We get some great poems. Like this one, by Harry Man. I like this because of the mixture of cakes and apples. An apple a day keeps the doctor away, but a cake a day? Your blood sugar skyrockets. Also, it was short, concise and funny. Other poems we liked because of their strangeness, and the way they made language seem new. Simon Barraclough’s poems used apple-related ideas, but turned them into something else – one poem, ‘Peel’, was about Emma Peel from The Avengers, whilst also about apple peel being thrown through the air. Some poems we choose personally, or emotionally, and couldn’t explain it – they struck our minds the way something might strike a nerve. Our only rule is: short poems. Two or three lines long. They fit better on cakes. The ideal Poetry Digest poem gets in and out in 12-15 words, and leaves an impression on those who eat and read it. Once we have chosen our poems, we launch the issue with readings from the poets. It’s fun to meet the poets we’ve chosen, and to talk with them about poetry in an enthusiastic way. For YPN, Swithun Cooper and Chrissy Williams set up a new Poetry Digest challenge, where poets were asked for submissions under the theme of ‘The Limelight’. The Poetry Digest team then took a selection of these poems to put on cakes, ready for an afternoon of readings, meeting and eating at the Poetry Cafe. You can view some of the poems here. Perhaps you’ll use them as inspiration to write your own treat-size poems. Chrissy Williams lives in London, has had work in The Rialto, Horizon Review, Anon, Fuselit, Rising and Southbank Poetry and was included in The Rialto’s Young Poets feature, S/S/Y/K/4 and in the new anthology Best British Poetry 2011 (Salt). She works on the Poetry Library’s poetry magazine archive and wishes she had a dog. Swithun Cooper’s poems have appeared in Acumen, Magma, The North, Poetry London, and The Rialto, as well as the anthologies City State (Penned in the Margins) and Dove Release (Worple Press). He won an Eric Gregory Award in 2009 and has recently written articles for The Warwick Review. The school is a trap of bombast maths with English and geography to go with that. Hi Julius, thanks for your poem. To submit work you need to follow the instructions on the webpage. Email your poem, on the theme “Lime Light”, with your name and “Poetry Digest” in the subject box and send it to ypn@poetrysociety.org.uk – Good Luck! Can I just check whether we are restricted to 12-15 words for the poem, or if that’s just the ideal amount? Hi Ruth, 12-15 words is a guideline based on poems Poetry Digest have selected in the past. You can go over or under! We just thought it would be helpful to give an idea of what fits on cake. Got it! It’s in with the others.